to be a source of acid mine drainage if not handled carefully. In the past, this material was simply piled up; nowadays, disposal requires compaction and stabiliza­tion measures. fugitive dust The silt, dust, and sand that become airborne, carried away from a mine property by the wind. mountaintop removal An often profitable but controver­sial method of surface mining in mountainous terrain where the coal seams lie beneath the ridge tops. All of the overburden is removed, exposing 100% of the coal for recovery. The controversy is due to the fact that the initial spoil must be placed in valley or head-of-hollow fills, though most of the subsequent spoil is placed on the level land left after mining proceeds. The final surface configuration, compared to the original land­scape, has less relief. Office of Surface Mining (OSM) A United States federal agency created by the Surface Mine Control and Reclamation Act of 1977, with responsibilities that include overseeing state enforcement of reclamation regulations, collecting fees per ton of coal mined, disbursing those funds (within the limits provided annually by Congress) to the states for reclamation of abandoned mined lands, and providing technical assistance and guidance to the states. remining Reclamation of previously mined land by private companies, which extract the coal that was left behind by earlier mine operators; water treatment liabilities are not acquired by the new operator unless the new activity makes the water quality worse. subsidence When fracturing and collapse of strata extend to the land surface; often associated with underground excavations. large part to the efforts of the environmental activists and the environmental regulations that they inspired, but it is also due, in part, to advances in technology that have made cost-effective environmental progress possible. Such technology can be used to avoid and prevent, or to reclaim and remediate, environmental problems. Any intensive use of the earth’s resources carries with it potential environmental consequences. Mining is no exception. Historically, mining companies have extracted the earth’s resources wherever economics made it feasible, secure in their knowledge that their products were essential to society. 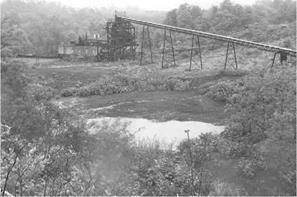 Prior to the passage of the Surface Mining Control and Reclama­tion Act in 1977, 1.1 million acres (445,000 ha) of coal-mined land in the United States was left unreclaimed and over 10,500 miles (16,900 km) of streams and rivers were adversely affected in the Appalachian region alone. At about the same time, 55,000 ha of mined land was left derelict in Great Britain, though not all of that was due to coal extraction. Although numbers are not readily avail­able for other countries, it can safely be said that leaving land unreclaimed was common around the world during the time period prior to environmental legislation in the United States (Fig. 1). FIGURE 1 Unreclaimed mine site; vegetation is largely volunteer growth. regulations and to minimize adverse environmental impacts; exceptions exist, however, and serve to inspire environmental activists and conservation groups to resist and reject mining wherever it is proposed. This societal tension serves as a backdrop to the dynamics of issuing or rejecting mining permit applications.